Palm Sunday Choir festival planning is underway! 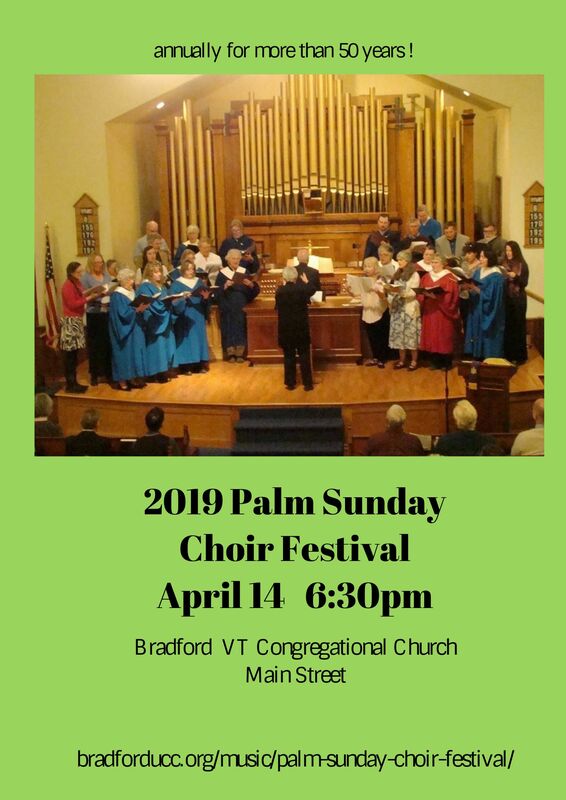 There is a new web page for the Palm Sunday Choir Festival! 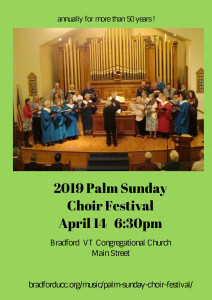 Please visit http://bradforducc.org/music/palm-sunday-choir-festival. You can find out which pieces the combined choir will sing, find links to YouTube recordings, and more. We hope you will join us for the festival on March 25, 2018! 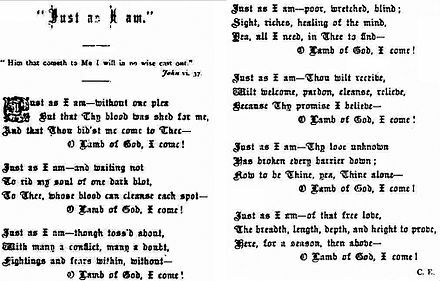 Our commissioning hymn this second Sunday of Lent is the well-known “Just As I Am” written by Charlotte Elliott in 1835. In one sitting she wrote what she felt is the Gospel of pardon, peace and heaven. 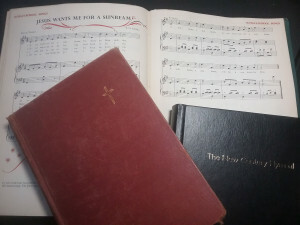 Just what are hymns, anyway? Our commissioning hymn this Sunday is nick-named Saint Andrew’s hymn due to its second verse: “As of old, Saint Andrew heard it, by the Galilean lake, turned from home and toil and kindred, leaving all for His dear sake.” Here is its back-story. Tonight’s concert by Full Circle is postponed until next Friday, Dec. 29. It will be just as joyous and fun a few days after Christmas when a winter snowstorm is not engulfing New England! Organist John Atwood’s prelude for our worship on December 17th will be Johann Michael Bach’s delightful arrangement of In Dulci Jubilo, which means “In Sweet Rejoicing.” Johann was the first cousin once removed and father-in-law of J.S. Bach. 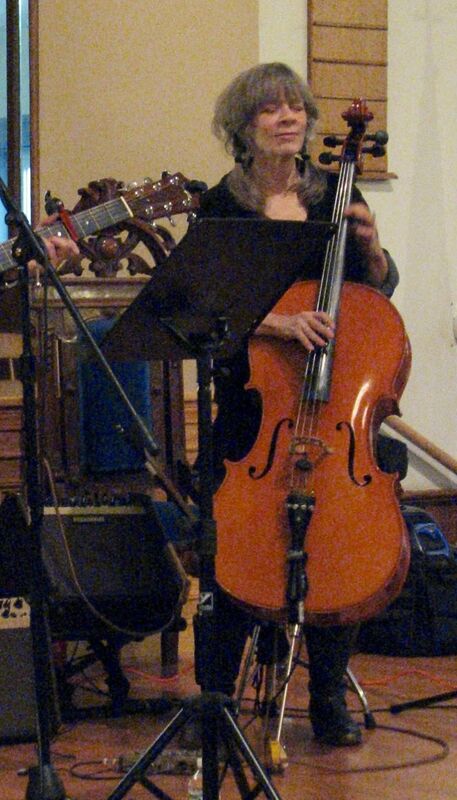 Cellist Phyllis Shea will be our guest musician for the morning worship service on December 17th. She has been improvising on the cello for fifteen years, playing harmony and bass lines with local musicians. She plays every week at the Colatina Exit and Salt Hill in Hanover, and she frequently plays at Peyton Place, the Greenhouse, First Night venues, and other places. Phyllis lives in Bradford and works at Oxbow High School as the school nurse.